Napa, Sonoma, Santa Ynez Valley, what these places have in common is that they are wine regions. What they also have in common is that they are in close proximity to cities – Napa and Sonoma to San Francisco and Santa Ynez to Santa Barbara. While a trip to wine country is always welcome, these days you do not have to leave the city to go wine tasting. Both San Francisco and Santa Barbara offer urban wine tasting experiences, featuring the wines of the neighboring wine regions but with the convenience of being in the city. Santa Barbara Wine Country is forty-five minutes north of the city of Santa Barbara. With Los Olivos, Solvang and the Lompoc Wine Ghetto, as well as all the estate wineries, there is plenty of wine tasting to be done in the area. But over the past few years, many of the wineries have been opening wine tasting rooms in downtown Santa Barbara, also known as “the American Riviera”. While there are no vineyards downtown, the proximity to the Pacific Ocean is appealing. With a unique range of tasting rooms in the city of Santa Barbara, your entire visit can be focused on wine or can be interspersed between eating, shopping and hanging at the beach. There are more than two-dozen wine tasting rooms on the Urban Wine Trail. 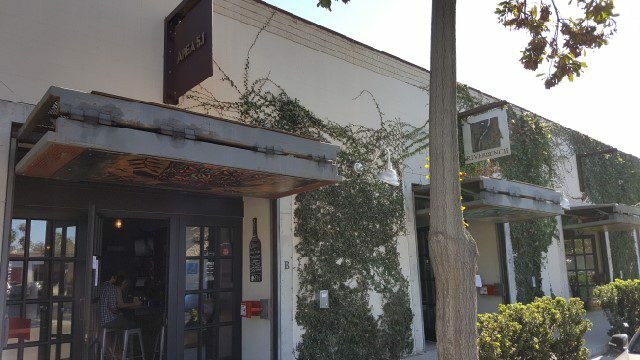 The Urban Wine Trail is comprised of the Wine Collection of El Paseo, The Funk Zone and a few scattered tasting rooms in downtown Santa Barbara. The Funk Zone is an area between the 101 Highway and the beach. The heart of the Urban Wine Trail lies in the center of Santa Barbara’s arts district. The Funk Zone comprises ten walkable blocks and is adjacent to the train station, the ocean and downtown Santa Barbara. From day to night the Funk Zone is a dynamic area. During the day, you can casually stroll down the street, stopping at different tasting rooms. Enjoy sparkling wine at Riverbench Winery, explore the uniqueness of the Santa Barbara AVAs at The Valley Project, or visit any of the others you pass along your walk. The Santa Barbara Wine Collective offers wines from a group of like-minded producers in a communal tasting room. They share a space with Helena Avenue Bakery who makes bread daily and you will not be able to resist ordering a sandwich or bakery item. Next door is Les Marchands, a wine bar and retail shop, where you can enjoy both local and international wines. Then at night the tasting rooms come alive, with live music pouring out the doors of multiple tasting rooms. The Wine Collection of El Paseo is located in the historic and picturesque El Paseo building off State Street and across the street from the Paseo Nuevo shopping center in the Presidio neighborhood. 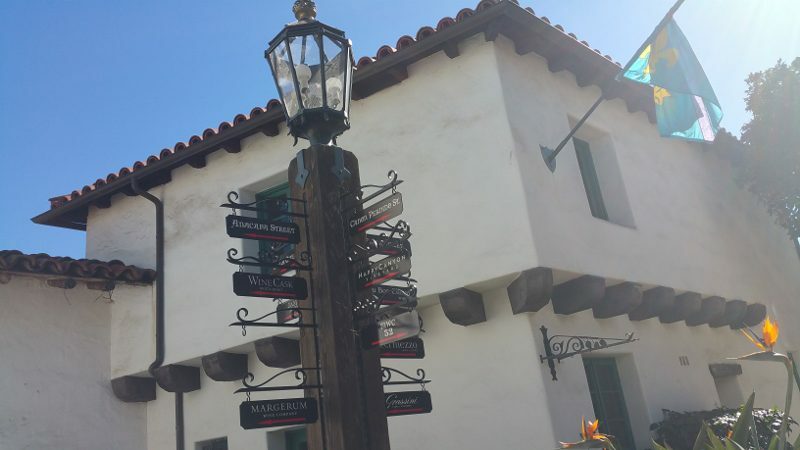 This is the oldest neighborhood in Santa Barbara, dating back to the 1700s. The Wine Collection of El Paseo is home to six tasting rooms, all small-production, boutique wineries producing wines from some of the best vineyards in Santa Barbara County. Located on the corner of Laguna and Haley, The Mill is one mile east of the Funk Zone. The Feed Mill, known today as The Mill, was constructed in 1904. Today it is a local artisan marketplace where Potek makes their wine and has their tasting room. There is also a brewery, restaurant and a few shops. Winemaking actually took place in San Francisco before it began in Napa or Sonoma. But between the 1906 earthquake and Prohibition, production ceased to continue in the city for decades. 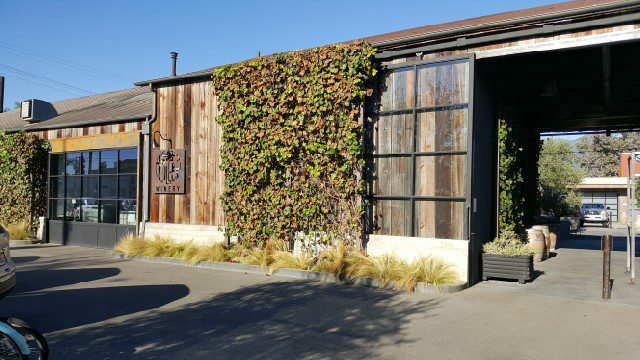 Today a few wineries have opened their production facilities in warehouse spaces in the SOMA and Dogpatch districts in the south part of the city. Additionally, a couple of wineries from Napa and Sonoma have opened second tasting rooms in the city. No need to head to Napa when you can just head to The Westin St. Francis on Union Square to taste the wines made famous in the Judgement of Paris blind wine tasting in 1976. Tucked into the main lobby of the hotel, the tasting room is a nice respite from the crowds of Union Square. The tiny tasting room can seat five people at one time. A $25 tasting will feature five wines and if you are a wine club member, you can pick up your shipments there. 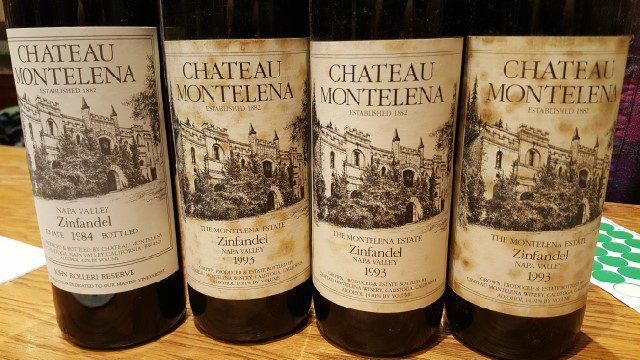 Until recently, Chateau Montelena Winery was the only Napa-based winery with a second tasting room in the city. But recently Raymond Winery opened a tasting room at the Ritz Hotel. 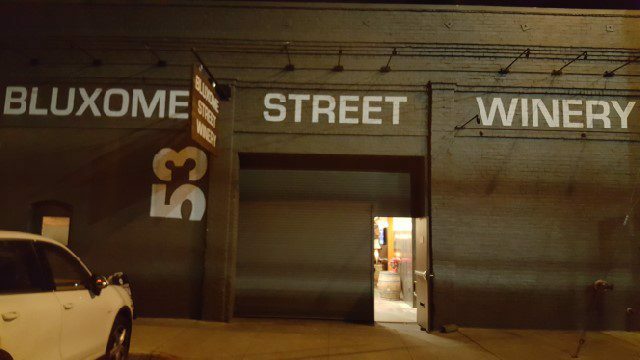 A few blocks from Giants ballpark, Bluxome Street Winery converted a warehouse into a hip space where the empty wine barrels have been converted into speakers and the light fixtures are glass demijohns. Bluxome Steet owns the organic Balinard vineyard in Russian River where they grow three pinot noir clones. But they built the winery in the city to revive the historic tradition of winemaking in San Francisco. Flights are $12-$18 and include three to five wines. Small snacks are available as well. Urban wineries may not offer the romance of the vineyard but they a convenient way to taste wine in the city. This entry was posted in Lifestyle, Travel, Wine and tagged Bluxome Street Winery, California Winery Advisor, Chateau Montelena Winery, San Francisco, Santa Barbara, The Funk Zone, The Mill, The Westin St. Francis San Francisco on Union Square, Urban Wine Tasting, Wine, Wine Collection of El Paseo, wine tasting by Allison Levine.